Watch video review! Write your own review! Currency Converter: U.S. dollar - approx. 23.40Argentine peso - approx. 330Australian dollar - approx. 30.21Bahamian dollar - approx. 23.40Brazilian real - approx. 84.22CFA franc - approx. 13,558CFP franc - approx. 2,466Chilean peso - approx. 15,547Chinese renminbi - approx. 151.54Colombian peso - approx. 70,234Croatian kuna - approx. 155.23Czech Republic koruna - approx. 559Danish krone - approx. 153.79East Caribbean dollar - approx. 62.95European Euro - approx. 20.67Fiji dollar - approx. 48.30Ghanaian cedi - approx. 89.63Guatemalan quetzal - approx. 184.21Honduran lempira - approx. 527Hong Kong dollar - approx. 181.50Hungarian forint - approx. 6,434Icelandic krona - approx. 2,898Indian rupee - approx. 1,555Indonesian rupiah - approx. 309,175Israeli new shekel - approx. 88.39Jamaican dollar - approx. 2,856Japanese yen - approx. 2,548Malaysian ringgit - approx. 91.91Mexican peso - approx. 408Moroccan dirham - approx. 226.34Myanmar kyat - approx. 27,514Neth. Antilles guilder - approx. 41.66New Zealand dollar - approx. 33.70Norwegian krone - approx. 192.24Pakistan rupee - approx. 2,452Panamanian balboa - approx. 23.40Peruvian new sol - approx. 76.60Philippine peso - approx. 1,081Polish zloty - approx. 89.10Romanian new leu - approx. 92.53Russian ruble - approx. 1,551Serbian dinar - approx. 2,544Singapore dollar - approx. 31.65South African rand - approx. 339South Korean won - approx. 26,801Sri Lanka rupee - approx. 3,399Swedish krona - approx. 190.05Swiss franc - approx. 22.55Taiwanese new dollar - approx. 756Thai baht - approx. 819Trinidad and Tobago dollar - approx. 154.43Tunisian dinar - approx. 47.05Turkish lira - approx. 66.54U.A.E. dirham - approx. 85.96U.K. pound sterling - approx. 16.40Venezuelan bolivar fuerte - approx. 233.93Vietnamese dong - approx. 526,140 * Exchange rates shown above are estimates only, and may vary slightly from the rates charged by PayPal or your Credit Card Company. 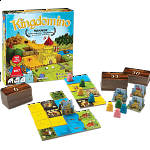 Build a 5x5 kingdom with your dominos worth the most points. 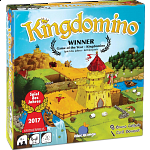 Family strategy game for ages 8 and up! Dominoes with a kingdom-building twist! Build your kingdom and try to have the most glorious one! In Kingdomino, the more connected plots of the same landscape you have, the more points you gain. But be careful: if you don’t have the related buildings you won’t score any point!